SAP S/4HANA has become the digital platform to run businesses in the Digital Economy. In this series we want to provide more depth by interviewing our product experts. User experience forms a large part of the end to end customer experience. We want to ensure our end users feel welcome to adopt the new digital processes. But FIORI is not only about a nice look and feel. SAP Fiori is about “Insight to Action” and “Exception based handling”. Guiding users to where their attention is required defined the inflection point for the SAP Fiori live tiles. Please keep that on mind when you look into SAP Fiori. New services and digital businesses require new user interaction concepts. In this interview, we will talk to Sven Krüppel-Berndt Head of SAP S/4HANA Portfolio and Adoption. Sven will give us an insight into the highlights of SAP Fiori and the benefits you can derive from it. Bert: Hello Sven and thank you for joining us in this interview. Sven: Thank you for the opportunity to talk about SAP Fiori Innovations with the SAP S/4HANA 1610 release. Bert: I believe there is a great interest in this topic, so let us jump right into it. Can you explain to us why SAP Fiori is important when we talk about SAP S/4HANA? Sven: Yes, of course. SAP Fiori plays a central role in the context of SAP S/4HANA. 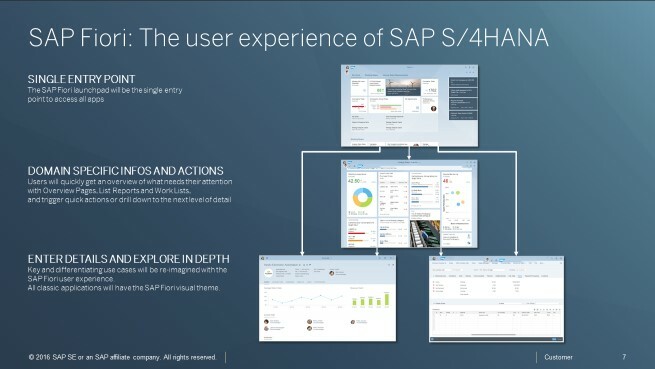 In fact, SAP Fiori is the user experience for SAP S/4HANA – providing users a brand new and harmonized working experience. 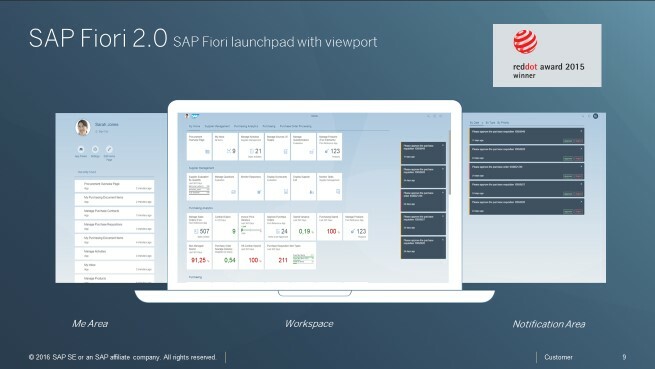 We are introducing SAP Fiori 2.0, which is a significant step forward in the design of SAP Fiori. With a simplified way of working, business users can perform their tasks faster and more efficiently than ever before. Business users have one single point of entry via the SAP Fiori launchpad and can access all relevant applications from there. They can retrieve domain specific information, trigger quick actions and drill down to the next detail level where required. Search supports them to find what they need while notifications draw their attention to what is important and requires immediate action. New SAP Fiori floorplans such as Overview Pages, Work Lists, and List Reports support users to get their work quickly done. Bert: This really sounds as a simple and easy way of working. Could you also elaborate on the design approach of SAP Fiori? Sven: Sure. From a design perspective, SAP Fiori is based on the five core principles: role-based, adaptive, simple, coherent, and delightful. Role-based means that SAP Fiori is designed for the users’ needs following the way they work. Adaptive means that SAP Fiori adapts to multiple use cases and can run on multiple devices. Simple means that the focus is only on what is necessary without overloading users with information that is not relevant in the current context. Coherent means that the user experience is consistent across areas and tasks. Finally yet importantly, delightful means that thanks to its easiness of use SAP Fiori can create an emotional connection to users. Bert: So, we can say that SAP Fiori provides a delightful user experience! Does this mean that there are SAP Fiori apps for every single task? Sven: Well, there are SAP Fiori apps for numerous key scenarios and tasks. Often users need to dig into deeper levels of complexity to perform specific tasks. In some cases, they will make use of SAP Fiori apps and in other cases; they will open ‘classic applications’ presented in the SAP Fiori visual theme. In fact, the user will have one coherent user experience overall. Bert: This sounds like an easy and enjoyable working experience. However, could you elaborate on the ‘classic applications’ and the SAP Fiori visual theme? Sven: Sure. The classic applications refer to WebDynpro ABAP and SAP GUI applications. SAP customers reported that for many tasks they need and wish to keep these applications. With SAP S/4HANA the classic applications will run with the SAP Fiori 2.0 visual theme, called Belize. This visual design shares the same colors, control design across applications bringing the look and feel of classic applications as closely as possible to SAP Fiori. We have started with the WebDynpro ABAP and the SAP GUI for HTML and next year we plan to move forward with SAP GUI for Windows. With the SAP Fiori visual theme we expect to achieve more harmony between the applications while allowing our customers to keep using the classic applications where needed. Bert: But thinking one-step further, what shall customers do with their homegrown applications? Sven: Customers have two options. We recommend them to evaluate their applications thoroughly. For key and most-used applications, they may decide to create their own SAP Fiori apps following the SAP Fiori design principles. For other applications, they may consider to adapt them to the SAP Fiori visual theme. SAP provides a guide for administrators and developers to help them with this adaptation here. Bert: You mentioned before the users’ single point of entry in SAP S/4HANA, the SAP Fiori launchpad. Which client options do customers have here? Sven: Well, customers can access the SAP Fiori launchpad with a web browser or by using the SAP Business Client. When using a web browser SAP GUI transactions are launched with SAP GUI for HTML, also known as “WebGUI”. This option does not require an installation of a local client at the user’s PC. Alternatively, users can run the SAP Fiori launchpad within the SAP Business Client. This locally installed client uses the SAP GUI for Windows to run GUI transactions. This option combines the benefits of browser-based applications with the benefits of local clients. This option is available only for the on-premise deployment of SAP S/4HANA. Please notice, that the SAP Fiori visual theme is planned, though not yet available for SAP GUI for Windows. Bert: In this context, is it possible to talk a bit about the SAP Fiori architecture? Sven: Yes, of course. The picture below shows the architecture for SAP S/4HANA Cloud to the left. However, let us focus on the architecture of the on-premise deployment of S/4 HANA which we see in the middle of the picture. SAP recommends installing the Frontend Server on a separate instance to remain flexible on the frontend side. On the Frontend Server, we have the SAP Fiori apps with the o-Data Services. One Frontend Server can connect (within some restrictions) to different backend systems, such as SAP S/4HANA, SAP Business Suite and others. 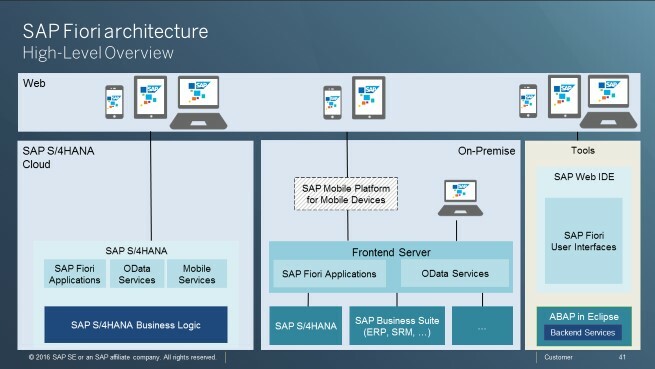 For mobile use of SAP Fiori apps, we can see the optional Mobile Platform for Mobile Devices, which offers valuable capabilities such as security and device management among others. Besides the standard SAP Fiori apps, customers often wish to create their own SAP Fiori apps tailored to their very specific requirements. For this purpose, SAP offers a web based and integrated development environment on the SAP HANA Platform, the WebIDE, which helps to simplify end-to-end application development. Bert: One topic that we receive many questions about from customers is authorizations. Therefore, my last questions is how the concept looks here. Sven: Then let me spend a few words on authorizations. 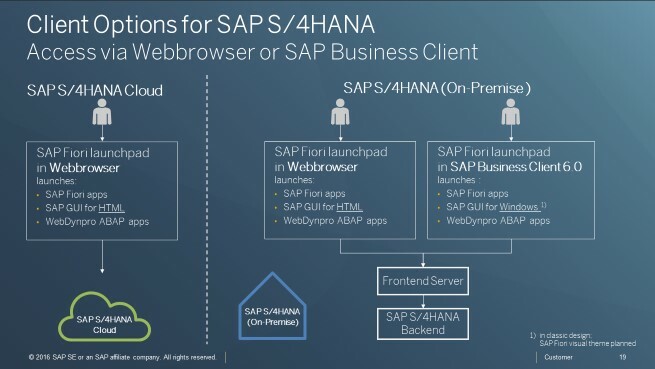 We have learned that SAP Fiori requires a Frontend Server that connects to one or multiple backend systems. The user requires authorizations in both, the backend and frontend system. In the backend system there is no change to the authorization approach, i.e. we stick to the existing authorization role concept here. In the frontend system menu roles are needed to define which apps are visible and accessible to the user in the SAP Fiori launchpad. Please note, in this context, ‘apps’ can refer to both, SAP Fiori apps and to ‘classic’ applications. Here, I would like to point out that with SAP S/4HANA 1610 we deliver sample content for more than 100 business roles. In addition, we ship thousands of so-called App Descriptors for SAP GUI transactions and WebDynpro applications, which can be used to integrate these classic applications into customer specific launchpad catalogs and roles. Administrators at customers and partners can take the SAP roles and app descriptors as starting point to build own custom roles and extend the content by adding customer apps and transactions according to their needs. If you want to learn more about the roles and apps shipped by SAP refer to the SAP Fiori apps reference library. There you will find all information required to discover and implement SAP Fiori apps and integrate classic applications into the SAP Fiori launchpad. Bert: Well Sven, I think that we answered quite a few questions about SAP Fiori and SAP S/4HANA. So thanks again for taking the time and enlightening us. SAP User Experience Community – offers news and information on UX topics as well as discussion forums. SAP Fiori apps reference library – contains all information required to discover and implement SAP Fiori apps and integrate classic applications into the SAP Fiori launchpad. SAP Roadmaps – comprises the SAP roadmaps for Industries, Lines of Business, Platform and Technology and Cross Topics. The SAP Fiori roadmap can be found under Cross Topics. This is only one of many topics we will cover in this series. With this we want to give you an insight into the topics you were always interested in knowing more about. Thanks again to the experts for sharing their knowledge with us. Next up is Co-Innovation. 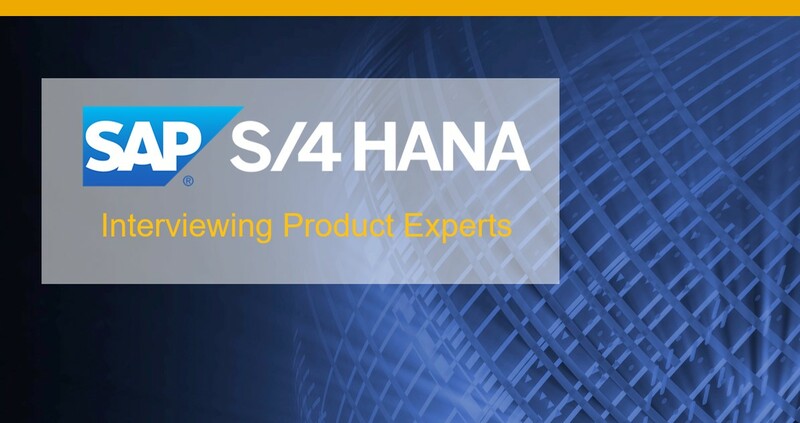 If you enjoyed this blog, found the information useful or want to read more blogs like these, let us know by hitting the “Like” button and if there is any topic with SAP S/4HANA you would like to hear more about, tell us in the comments below.